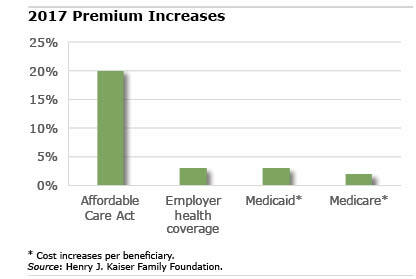 That’s not to say everyone can afford their employer medical plans. Workers in small companies pay a larger share of the total cost burden – particularly for family coverage – than workers in large corporations. Further, workers increasingly are enrolling in high-deductible health plans – more than one in four today, compared with one in 20 a decade ago. These deductibles were, indeed, stable last year, but they average more than $1,505 for single workers in plans with a deductible, up from $616 a decade ago. Rising deductibles are one reason a large minority of Americans say they have difficulty paying for their medical care. Coverage has also eroded: 89 percent of workers today have insurance through an employer, compared with around 93 percent in the early 2000s. Again, the coverage is spottier in small businesses with under 10 employees: only 40 percent are covered. Employer health insurance for workers, Medicaid for the poor, Medicare for the elderly, and the ACA exchanges for the rest – from one U.S. household to the next, there is an unpredictable disparity in health care spending. It’s a shame all the confusion and stress the whole ACA fighting is causing. As the article points out, vast majority of folks are not really impacted by all the noise. While large groups had to comply with ACA benefit rules I doubt they will elect to reduce benefits, regardless of any “repeal and replace” action. The fighting is primarily over the small slice of the country (though totals millions) without access to group coverage. The ACA created winners and losers under the new rules. Winners are those benefiting from expanded Medicaid or enjoying rate subsidies and/or cost-sharing reductions on their plans, along with people with “pre-existing conditions” now able to get coverage. Losers are those with too much income for Medicaid or subsidies, but not enough to afford today’s sky-high premiums and deductibles. These folks lost plans and options that were otherwise affordable before the ACA. For them, the ACA was a disaster. These same folks who will pile into short term medical plans now that the 90-day coverage restriction is being lifted by executive order.